Download As Above / So Below in Digital HD from the iTunes store. 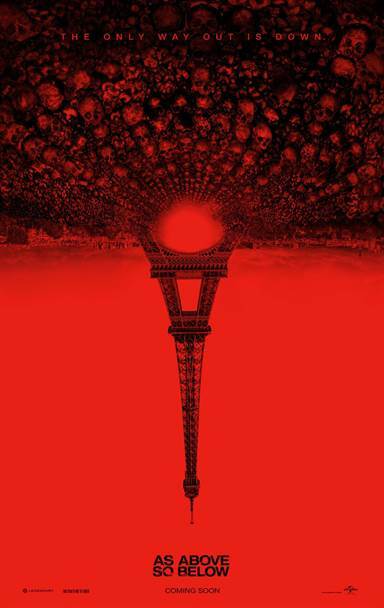 As Above / So Below images are © Universal Pictures. All Rights Reserved. As Above, So Below, the latest horror thriller co-written and directed by John Erick Dowdle (Quarantine, Devil) opens this week in theaters. Set in the catacombs under Paris, As above follows a team of explorers as they discover the horror under the City of Lights. While underground the explorers have visions of their pasts which haunt them. Starring Perdita Weeks (The Invisible Woman) as Scarlett, the daughter of a scholar and explorer who was on the quest to find the Philosper's stone, she takes the charge to continue her father's work after he hangs himself. When a discovery in the caves of Iran leads her underground in Paris she recruits a group of misfits to help find the elusive stone. Her love, interest, George, played by Ben Feldman (Mad Men) reluctantly joins this group even though his brother, ironically, drowned in a cave when they were children. Rounding out the cast are Edwin Hodge (Die Hard:With a Vengance) as Benji, Francios Civil (Frank) as Papillion, Marion Lambert as (Souxie) and Ali Marhyar (Zero Dark Thirty) as Zed. Spoiler alert: Half the cast dies in the catacombs. As Above, So Below is shot as documentary format in the same vain as The Blair witch project while being not nearly as good. Adding to that there were moments I felt like I was watching "National Treasure" or "Raiders of the Lost Ark" as they use ancient clues and lost languages to locate "buried treasure". Much of the movie is spent watching them travel through the catacombs, deeper and deeper below the earth and after an hour it got really boring. As a side note, I don't recommend this movie to anyone with claustrophobia. Watching the explorers walk (run) from one narrow passageway to another and crawling over human remains in tight spaces is enough to cause someone with a fear of small spaces anxiety. While I enjoyed the moments based on reality, especially the human bones built into the walls under the city of Paris, I felt the movie lacked much of the character development. As mentioned, George's brother died in a cave so we know what his fear is and we learn at the end about Scarlett's guilt over not answering her father's phone call before he hangs himself but we never really find out what haunts the other members of the group; the things that ultimately lead to three people's demises. The biggest let down of all is the ending. Scarlett finally figures out the secret behind the philosopher's stone and it's simply cheesy. Once she "get's it", she uses it as the key to help the remaining member of the team find their way out of "hell" and crawl out of the catacombs alive. Once they are free, the movie ends rather abruptly and uneventfully and while I felt the beginning of the movie was interesting and held some potential the ending was a letdown and destroyed any chance of salvaging the film from the tedious mid section. The moments of suspense and horror were few and far between, and while they were enough for me since I don't generally like horror films, they would probably be considered "lame and weak" for true horror buffs. Every suspenseful scene was foreshadowed by sinister music, which signaled, "hey, a suspense scene is coming", ultimately ruining the element of surprise. It is in my opinion, that you should not waste your time or money on For As Above/ So Below, and stay home and rent "Poltergeist" instead. Well that was a load of s***.